I ordered my IoTaWatt about a month ago and it’s been running without hiccups since then, when about four days ago the readings on one of the channels dropped roughly 100W. The channel is normally fairly consistent around 250-260w so there’s no way this would just drop 100W by itself, plus the total on the main legs is still correct (and did not drop the corresponding 100W). [EDIT] Think I answered my own question, at least partially, I swapped Input 3 (which this is) to Input 12 (spare) and it’s now reporting correct values. Is this a setting / configuration issue or a board issue ? dunno. Not really enough information to even guess. First, what is the source of this graph excerpt? The Y-axis appears to be a geometric progression. So while a 100W drop is a fairly accurate description of what happened, it appears it would also be accurate to say that the power was halved. There are more possibilities for that than a simple 100W drop. Can you post an IoTaWatt local graph plot of that channel showing the drop? Can you also post the inputs setup display, the status display and the message log? I’m using InfluxDB and Grafana. 3/25/19 11:33:03z Updater: Installation complete. 3/25/19 11:33:05z timeSync: service started. 3/25/19 11:33:05z dataLog: service started. 3/25/19 11:33:05z historyLog: service started. 3/25/19 11:33:10z Updater: Auto-update is current for class BETA. 4/10/19 17:04:13z Power failure detected. 4/10/19 17:04:17z Connecting with WiFiManager. 4/10/19 17:04:20z timeSync: service started. 4/10/19 17:04:21z dataLog: service started. 4/10/19 17:04:21z historyLog: service started. 4/10/19 17:04:22z Updater: Auto-update is current for class BETA. 4/14/19 13:30:12z Power failure detected. 4/14/19 13:30:16z Connecting with WiFiManager. 4/14/19 13:30:23z timeSync: service started. 4/14/19 13:30:23z dataLog: service started. 4/14/19 13:30:24z historyLog: service started. 4/14/19 13:30:25z Updater: Auto-update is current for class BETA. You haven’t set the timezone of your IoTaWatt, so it is reporting UTC (GMT), while your browser is assuming that it is getting local time (that’s all being fixed in the next release). Looking up your timezone, I think you are at UTC-4 right now, so when your browser is plotting the drop at about 13:00 on April 10, it was actually around 17:00 UTC. Looking at the message log, I see a power failure at that time. So something happened coincident with this. Was this actually a power failure, or was it a deliberate power cycle restart. If it was a power failure, it was pretty short. As I look at the post 100W drop, I can see that the small spikes representing other transient loads are smaller after the drop by about the same 40% as the 100W drop. So in general, the reading for that channel are depressed. That’s hard to do. Electrically, there are very few components that are unique to one channel. I suppose it’s possible, but I have never seen it before. The problem remediation that you reported at about 9:40 this morning was also coincident with the next power failure at 13:38 UTC or 9:38 EDT. 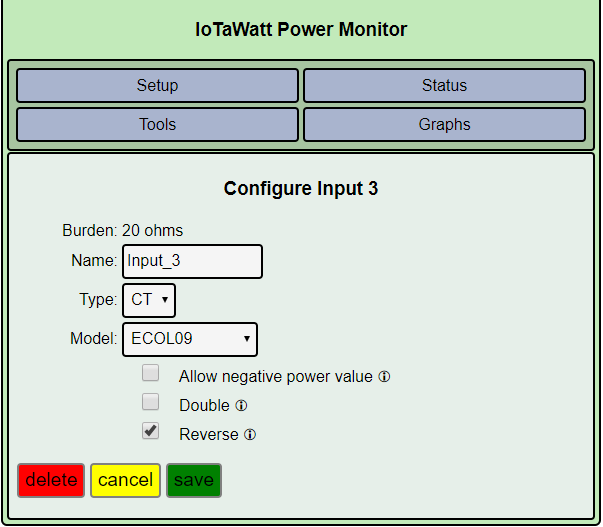 So again, are you power cycling the IoTaWatt, and why? Moving inputs and changing configuration does not require restart. I don’t know what is happening, but I doubt it is hardware. Can you see what happens if you plug it back into input 3? Don’t worry about moving the CTs around and unplugging while running. Both the CTs and the IoTaWatt are protected against open circuit and transient voltage spikes. I’m using UTC since that seem to work best for/with InfluxDB and Grafana. I don’t remember any issues on April 10th, but that said, we do have blips in the power every now and then. The power cycle this morning was me, I wasn’t sure if unplugging it while powered on could cause damage plus I had to put a cover onto the external metal box/outlet serving the IoTaWatt and that cover also holds the outlet in place (not separate screws like on a normal box/outlet so I figured better safe than sorry and switched off the power briefly. I did switch the input back and it’s works perfectly - guess I should have tried that before jumping to the conclusion that it probably was hardware related (sorry about that). Many Thanks for your fast replies / support, especially being Sunday and all. Keep an eye and see if it recurs. Not a fan of unexplained problems. Regarding the time, IoTaWatt timestamps data to influx using UTC regardless of local timezone setting. I’d be interested in any influx problems related to timezone setting.